Today was a beautiful stunning Autumnal day, the sky was the sharpest of blues and the air warm but crisp. I love days like this, watching the seasons change and merge and this salad was the perfect gluten-free lunch to enjoy gazing out at the brilliant blue. I had never been a big taste fan of Quinoa until recently encountering it in the brilliant It’s All Good by Julia Turshen and Gwyneth Paltrow. 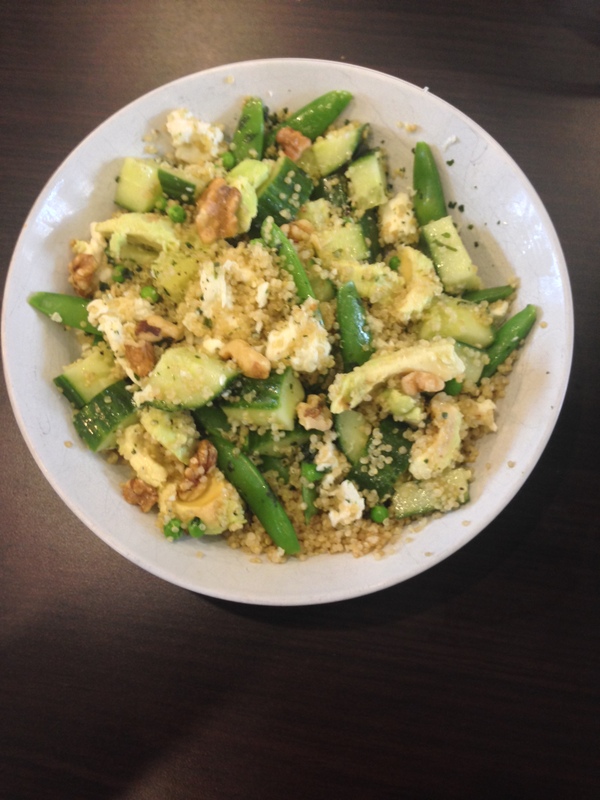 I now love Quinoa, as it can be very tasty and a wonderful gluten-free staple and a real super food. Apparently the Inca’s first realised the potential of Quinoa believing it increased the stamina of their warriors, but more on the amazing benefits of Quinoa later for me this salad is primarily about getting something delicious on my plate quickly. I now follow the top tips in It’s All Good and always rinse the Quinoa and cook up a batch to keep in the fridge, so that I always have some to hand as it is amazingly versatile. This is one of my favourite go to salads, as I literally throw it together for a tasty, easy and lunch. I am not going to include any quantities here as for me its all about the moment, working with the ingredients you have in the fridge, number of people you wish to feed and how you feel on a given day. This is how I love to Cook. I dressed this salad with olive oil, seal salt and coriander but I often very this with a creamier dressing of greek style goats yoghurt and a dash of olive oil and sea salt. I do this by measuring out my cups (sorry fellow Brits but I find this simplest way with the tiny grains) of Quinoa, rinsing under cold water then adding to a pan with equal cups of water (this works best for me). Bring to the boil then simmer with a lid on for 10 mins. Take lid off cover with a tea towel for 5 mins then fluff with a fork. 2. Boil a pan of water then when rapidly boiling add in your sugar snap peas for 2 mins. Then add your petit pois for an additional min. Take off the heat, drain and run under a cold tap until cold. 3. Peel and slice the avocado. 4. Cut and dice the cucumber. 5. Build the salad, or rather mix all ingredients thus far gently together. 6. Add the feta and walnuts. 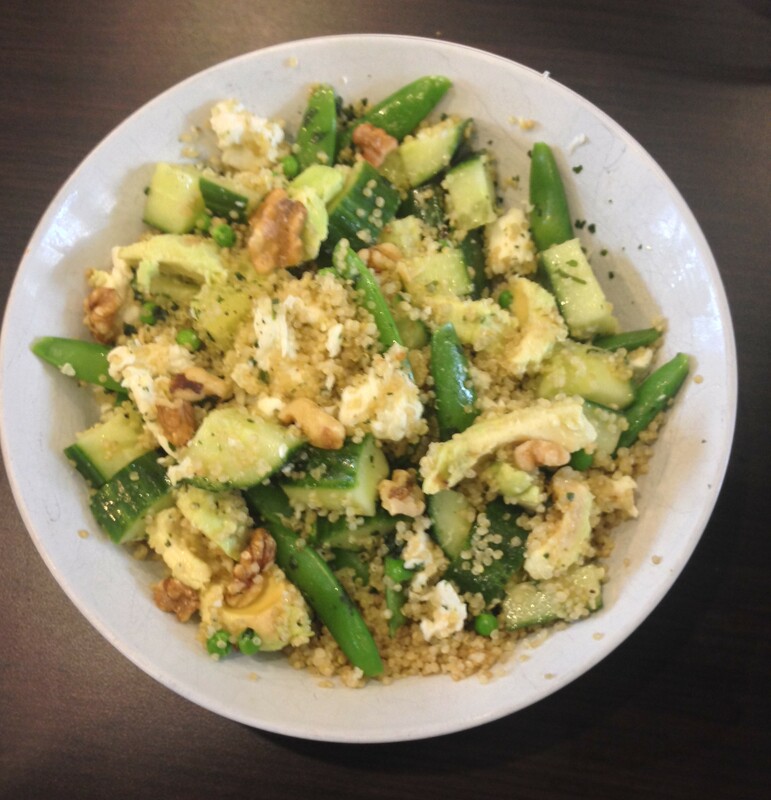 You can really do what you like with this salad and the green ingredients, rather than sugar snap peas I often use broccoli or mange tout or both, or goats rather than feta cheese and if I have them I’ll also often add spring onions. – great source of manganese, an antioxidant which helps prevent damage mitochondria (I admit I’m a bit lost here but you can google it) and protects red blood cells from injury by free radicals and finally…. Phew!! Quinoa really is a SUPER FOOD fit for warriors of any age. And of course lets not forget Avocados are great for your skin, weight loss, cardiovascular health, diabetes and arthritis. Cucumbers flush out toxins, are a good source of vitamins A, B and C, great for your skin, rehydration (great hangover cure ingredient), reducing cholesterol, cut cancer, look after your kidneys, and blood pressure. Oh my! Looks delish and I love the bold green color!